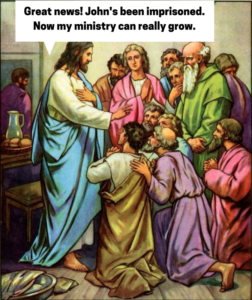 When Jesus heard that John the Firebrand’s rhetoric had caused him to be imprisoned by Herod Antipas, he realised that there would now be room for his own ministry to grow. When it comes to growing our churches or ministries we have been infected by a worldly corporate view of growth. A competitor is down, quick leap in the gap. The person who is in the position you want is leaving – what an opportunity! Some minister has been hit by a scandal – well they deserved it. In each case, the position has become more important than the people. We are more interested in advancing ourselves than loving others. We have moved from being Christ centred to self centred. 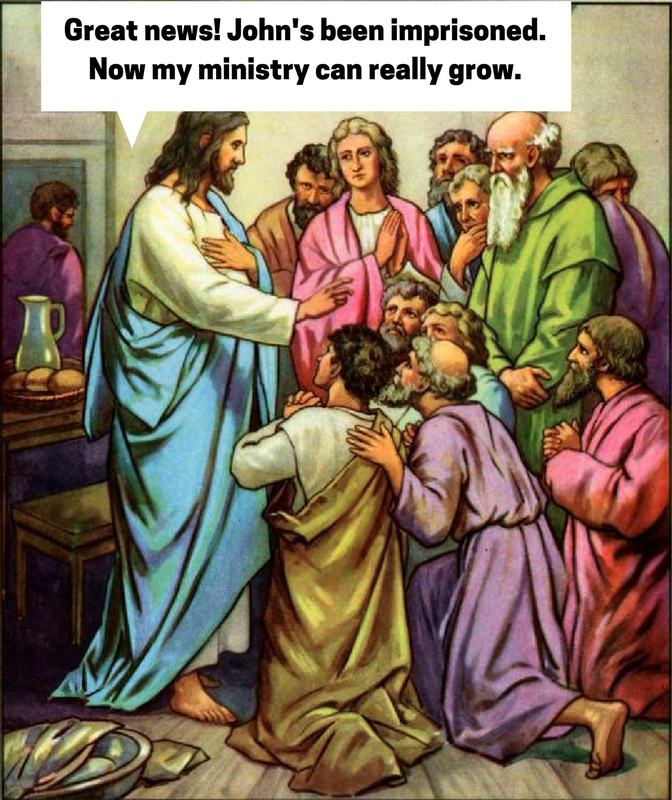 The Jesus here takes advantage of John’s misfortune to make things better for him. Isn’t it tempting for us to see the opportunity rather than to experience sorrow for John? Or maybe it’s just that there’s someone whose ministry you don’t like and then they experience a fall. Isn’t it tempting to rejoice rather than pray? I’ve done this. When there was the Todd Bentley craze, I was uncomfortable about many things – particularly some of his teaching and methods. So when he had an affair I confess that I inwardly rejoiced. I felt justified in my criticism. How far have I fallen from the gospel? I want others to be punished/suffer for their sin whilst expecting God to forgive me for mine. And ultimately the measure I use on others is the one God will use for me (Mt 7:2). If I want God to forgive me and change me then I too must forgive others and pray for others (Mt 6:12). I should have prayed for Todd that God would lead him into truth. When he fell I should have asked God for mercy and restoration. In short I should pray for them everything that I want God to do for me. Then I am a minster of reconciliation (2 Cor 5:18). Then I am a conduit of His love. As we mentioned in a previous post, the real Jesus honoured John as the greatest prophet (Mt 11:11) and moved when there was a conflict between him and John baptising more people (Jn 4:1-3). He wasn’t threatened because He was sure of His identity and His calling. The love He received from the Father He gave to others (Jn 15:9). Let us receive that love and give him our fears about our own unloveliness that lead us to put others down. And let us remain in that love by being a lover of others. In Jesus name. Amen.